Simple and versatile the Labcold Digital Portable Laboratory and Medical Transporter can both cool or heat and is designed for the transporting of samples, vaccines, pharmaceuticals or indeed anything that needs to be moved under temperature controlled conditions. Complete with an easy to read digital controller, this carrier uses mains or vehicle power via a 12v socket to cool or heat by way of an environmentally friendly peltier system. This makes it ideal for transporting vaccines by road and collecting samples in the field. 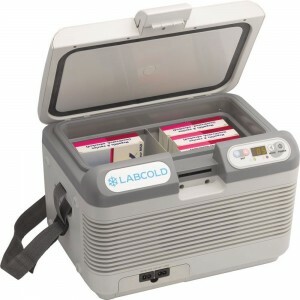 The Labcold vaccine and sample carrier is designed for temporary temperature control during transit or short term use only. It is not designed to be run for long periods of time nor for permanent storage or to hold temperature when not connected to a power source.